Hemiplanet Cave Is An Inflatable Tent That Can Take A Beating | OhGizmo! Going camping is all fun and games until you have to actually pitch a tent. Pitching a tent isn’t fun and it’s no game. At least not for this klutzy editor. 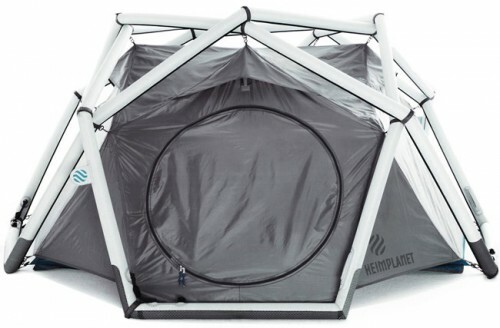 But the Hemiplanet Cave looks a lot simpler and a lot sturdier than your average everyday tent. Featuring a geodesic dome-like structure made from inflatable TPU bladders, a single pump is able to go from limp to rigid in a matter of minutes. The frame is shaped this way because it mimics the molecular structure of a diamond, a material known for its hardness; the frame is thus appropriately called Inflatable Diamond Grid” – IDG. The Cave sits six and sleeps three adults and a multi-chamber system ensures that even if one of the bladders is punctured, the entire thing doesn’t just deflate like a balloon. High-tech tents don’t come cheap however: the Hemiplanet Cave is €500. As a very experienced camper I highly doubt that tent could actually take that much of a beating. The inflatable frame can hardly handle strong winds or driving rain as well as an aluminium pole frame. I respect that a tent could be hard to set up (the first time) but I’d be willing to bet it’s still faster than blowing up all those tubes.